Photographs of the fronts and backs of coins including Penny, nickel, dime, quarter, half-dollar, and dollar. 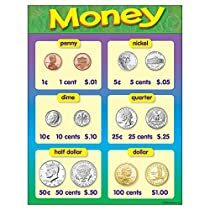 Includes coin values in numbers and words. Back of chart features reproducible activities, subject information, and helpful tips. 17″ x 22″ classroom size.